Something about this time of year just makes people feel more generous and kind. I've received the kindest emails lately from many of you. The other day I received a package of peppermint coffee from one of our buyers. So nice! We are in the middle of mad Christmas jewelry making. And suddenly our suppliers are not able to keep up with our volume. Yikes. So the other day, one of my employees grabbed me and said, "We're going to figure this out. Get your coat. We're going to Wichita. My uncle works in a sterling gallery." We stopped production for the day (which alone is quite scary) and headed out. And then she treated me to a cupcake from the best known bakery in town. I'm pretty sure that cupcake had 8,926 calories in it. And I had a serious sugar buzz when I was done. 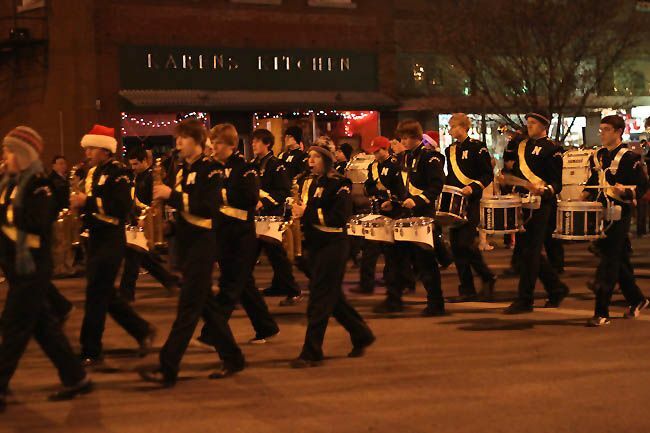 We had a local Christmas parade last week. There were carolers on the streets. My kids were in the parade, which they thought was the coolest thing ever. And I just love small town America. I say it all the time, I know. But it's even better around holidays. You see people you know on the street, chat, sip hot cocoa. It's community at it's best. We are feeling warm and kind too, and would love to give one of you a $25 gift certificate to TheRustedChain.com. To enter: Leave a comment telling one of your favorite Christmas traditions. You lucky duck! I miss living in a small town for this very reason. I feel like my kids are missing out on all sorts of fun things. I can't WAIT to get out of the big city! 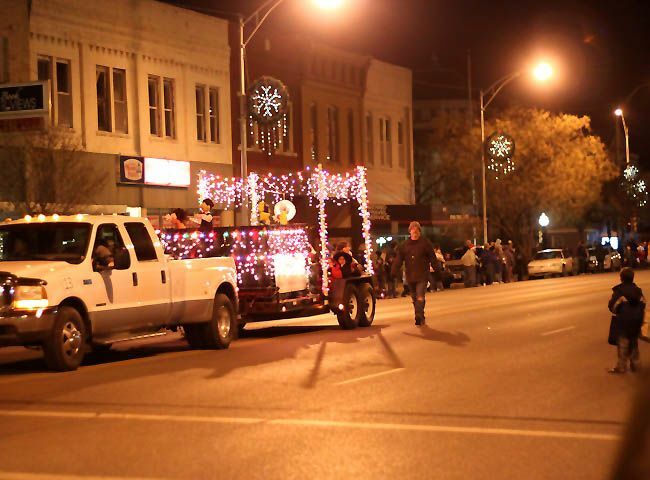 Before we moved here, we used to go to the Christmas parade in our small town. It was always THE place to catch up with old friends. Sitting quietly by our tree at night listening to tradtional Christmas Carols sung with a choir in an ancient cathedral and feeling the spirit of the holiday. Favorite Christmas Tradition: Going to the Candlelight Christmas Eve Service, coming home to my parents house to have chicken and dumplings and then open presents. I just love the familiar...things are a little different with my own kids now, but we still do what we can with my parents! the children's Christmas play at churhc. I love to here the Christmas story and see the funny things the angels do. Driving around looking at holiday lights! I love when houses are outlined, and I'm anti blow-up things. We've been acting out the Christmas Story (reading it from the bible while the other kids act it out) for as long as I can remember. As kids learn instruments we all listen to them play Christmas songs in between scenes. Luckily, just as we were getting too old to act the scenes out, my sister had her kids so the tradition continues on! there's the Christmas Eve pajamas and also we have decided to pick a family in need every year and forego some gifts we would get for each other and instead give it to that family. Sorry, when I went to leave a comment, I didn't do it right, so I deleted, if you don't want to count this that would be ok! I would save my favorite tradition is setting the alarm at midnight to exchange presents. It was our happy medium as his family always did presents on Christmas day and mine did ours on Christmas Eve and we could agree to change things up, so midnight it is! LOVE IT! reading the christmas story together! We have a traditional Christmas saying - that comes from my Dad, who's been with the Lord for 4 1/2 years...when he was very little, and family/friends arrived for Christmas celebration, the adults tended to linger on the lawn (Texas, y'all...temperate)too long for him. He would stand inside the front door and holler "Merry Christmas INSIDE!!!". For over 60 years, Christmas celebrations have begun with this greeting to one another...Merry Christmas INSIDE! My favorite Christmas Tradition is listening to my Grandpa tell the first Christmas story. We always read the Christmas story from Luke 2 before we open presents. I remember my dad reading it to us as kids, and now he reads it to his grandkids on Christmas Day. one of my favorite traditions each year would simply be getting to spend time with ALL of my family. Don't really know if that counts, but it's not so much as what we DO, as to who we are WITH. I love making Christmas cookies for Santa. My kids make a huge mess and laugh while baking. We tell stories and enjoy waiting for them to bake. You have a great friend there! I love when we decorate the tree as a family, have Christmas music playing, and get out the nativities and really start talking about the reason for the season. Thanks for sharing the pictures of the parade! It looks like it was a blast! My favorite Christmas tradition is sleeping in, staying in our pajamas and spending time as a family on Christmas morning. We have breakfast for lunch... then the rest is the rest. I love holiday traditions! Letting my kids open one present on Christmas Eve (always pajamas that they wear to our midnight church service), making cookies for Santa, "finding" baby Jesus hidden in the house before they can open gifts for Christmas. My favorite is remembering reading Twas The Night Before Christmas on Christmas Eve to my two children. This was definitely a Rudolph sighting in my young son's mind! He quickly grabbed his little sisters attention by trying to show her the reindeer too! Even if it was just a light off of a jet in the distant sky it made a wonderful memory for our entire family! My favorite tradition is after dinner we drive around looking at lights listening to christmas music! I have a tradition that I change the colors of my tree every year! I love it I begin planning next years tree the day after Christmas so that I can get the decorations on sale. This year I did a red, white and neon green Christmas tree. I love it I could keep it up all year, but then it wouldn't have the same value I guess! I think as I go through life, my favorite traditions change, as a child going out in the cold and picking a fresh tree, holding up everyone on the lot, and my Mom would always pick the first one we held up. And now as an adult, decorating the tree with my kids, we do one that only has their ornaments on it, my mom gets them each an hallmark ornaments every year, and now they have enough to do their own tree, its the tree in our living room, we put a tree in every room. As now as caretaker at a church, I love the hanging of the greens, putting up a tree in the back of the church, and making a poinsettia tree on the stage. And recently we started making candy as a family, what a blast that is, we spend all day doing it. So, guess thats a lot more than one huh?? Love this giveaway I WANT of those capture life necklaces sooo bad LOL. I love watching It's a Wonderful Life on christmas eve with my family. Use to be Christmas on Christmas eve at Howard and Jo Hastings house (grandpa and grandma)... and always the soup with for dinner! Love to play games with the family! One of my fave's is Dutch blitz, but there are lots of others that we love to play! love looking at your pictures! I wouls have to say my favorite tradition is very simple and its just driving around looking at Christmas lights! I LOVED it as a kid and now my kids LOVE it!! My favorite Christmas tradition has to be gathering up my entire family and heading out to Christmas midnight mass! It it so joyful to be surrounded by family during the holidays. My favourite tradition is the beginning of new traditions with my own family. Taking the traditions that my husband loved as a child and the ones that I loved as a child and combining those to create our own version of a magical Christmas for our own children! Your kids looked so cute! What a fun experience for them :) Coffee and cupcakes? You must have been nice. We buy the kids new pajamas and open them Christmas Eve--we did it when I was a kid and it was my favorite tradition back then, and it still is! We all get in our jammies - about a week before Christmas and make hot chocolate and hop in the car to go look at lights. one of my favorite traditions is riding around looking at lights listening to holiday music. We've done this since I can remember. Going to a Christmas tree farm to choose a tree. Growing up my favorite tradition was when Santa visited our neighborhood for the tree lighting and gave each child a gift. I can't wait to build more traditions with our own children. I LOVE being back in small town America! Our favorite tradition is bundling up with Hot cocoa and driving around to look at the Christmas lights! Now you are on my FB too. I just LOVE your jewelry way to much! We have a few of them, but going to the tree farm the day after Thanksgiving is the most fun and just seems to set the stage for how the rest of the holiday goes! Every year we watch a movie and have pizza on Christmas eve. It makes me feel all warm and cozy inside. I love going to Christmas Eve dinner with my family and then going to the 11pm service afterwards. We spend the time between driving around looking at Christmas lights - they always seem to shine brighter on a night like that! My favorite holiday tradition is getting hot chocolate and putting the kids in the car to drive around and look at Christmas lights together as a family. Driving around town looking at all the houses with holiday lights, doing the trek to the Park where the city puts on a lighted display each year, making a birthday cake for Baby Jesus. Christmas eve services! spending Christmas day in jammies that Santa brings enjoying the day with just our little family after opening presents and having breakfast. I love the night we go out as a family -to eat, shopping for each other and then loading up on candy and other goodies to eat the whole week leading up to Christmas. We did it growing up and its stuck with me as something to do with my own little family. Advent calendars are my kids favorite tradition...and I have a BIG stack of Christmas books we all ready every year. Watching Christmas Vacation every year is so much fun too!!! We have several Christmas traditions. We also read the Christmas account in Luke. We get together with extended family one evening. Until three years ago, this included great-aunts and uncles. On Christmas eve, we get together with my parents, my brother, and my grandma and we all play board games and eat cookies. Then we read the Christmas story and eat more cookies. Sometimes we sit around the piano and sing carols too. When we're done, we go back home and then we let the kids open gifts! It's quite fun! Love the family! On Christmas eve my mom and I always do our baking for Christmas. We stay up until all hours of the night baking and having girl time. Hubby and I then put together the pieces of our kid's Santa gifts. I think my favorite part though is when my kids put their cookies, milk and carrots out for Santa. The carrots are for the reindeer. we are at the stage with our extended family where things have changed alot this year so we are starting new traditions and Sunday we will be making gingerbread houses with about 20 kids in our family. My favorite Christmas tradition is new pajamas on Christmas Eve and then we turn off all the lights except the Christmas lights and have some quiet family time before heading to bed. 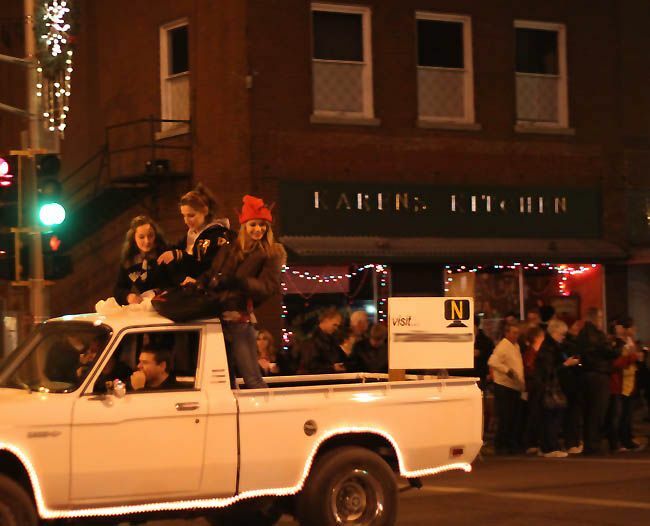 Was the parade in Hays? That's my hometown and I thought I recognized the decorations and the FOX sign! My favorite holiday tradition is eating waffles with family on Christmas Eve night and playing board games. I love our tradition of our candlelight service at church. Then it is home for oyster stew (this was a tradition that was started by my FIL's parents). It took me a few years to learn to like oyster stew. Love our Christmas Eve routine: late afternoon church service at CedarCreek followed by lasagna dinner at home followed by dessert followed by opening gifts from immediate family followed by candlelight 11 pm service at GUMC followed by putting on pj's and all settling down for a long winter's nap! Then it's Christmas Day! Our favorite Christmas tradition is making a birthday cake for Jesus and eating for breakfast on Christmas morning. I love the tradition of the midnight carol service on Christmas eve! thanks and loved looking at the pictures of the parade- how fun! Seriously, this is toooooo kind of you! I'm continuing an old tradition in our family. My Dad was a city firefighter and my Mom would ALWAYS take a huge amount of fun goodies to the firestation on Christmas Eve - whether or not Dad was working. My son and I have continued that tradition by taking goodies to our local firestation - well, until this year! This year, his Dad and I will be making the hour and a half drive to Anniston, Alabama and we will be delivering goodies to the Anniston Police Department. My son you see, is now an Anniston Policeman! I can't wait!!!! I cried when I realized that he would be working Christmas weekend. So, if he can't come home - we will go to him. Thanks again! tweeted it...thanks for offering this!!! thank you for your christmas spirit!! Going to Candlelight Christmas Eve service with my parents, grandmother, Aunt, Uncle and Cousins. Then the next day, helping out at the local shelter. We go to my grandparents every Christmas eve, and everyone brings a new dish a copies of the recipe for everyone. We have a "family cookbook" that I LOVE. Thanks for the chance to win! Merry CHRISTmas to you!! I added your giveaway to my blog! justmeandz*dot*blogspot*dot*com. when my daddy reads the christmas story from his faux-leather bible from the 70s. it's to "check" our hearts before opening gifts. There are so many, but I love the making of gingerbread houses with our girls, 2 and 6. Making Christmas cookies with the kiddies is my favorite tradition. I love decorating Christmas cookies and driving around town looking at the lights! Our traditions are very simple. For 17 years I have been a single mom to my 19 yr old daughter. Since we really can't afford much we bake and we bake some more. I have pictures of her all dressed in Christmas outfits and standing on a chair baking cookies. She was super stressed because of college finals this week so guess what I was treated to....chocolate crinkle cookies......ahh the simple things in life. One of my favorite traditions is getting the family together to make an old family recipe of Apple Strudel! I am sharing this on my facebook page!! My favorite tradition is writing the kids a note from Santa explaining the gifts. I'm not looking forward to when they don't believe anymore. BTW- I think a new tradition that started that I LOVE is Black Friday. I just ordered a necklace from you and love it! And would love one for myself! My favorite Christmas tradition is opening pjs on Christmas Eve and reading the Polar Express! We have 2 places here that so major light shows - set to music and all that, it is awesome to go watch, and we have a church the performs a living nativity outside. We LOVE these little bits of out community, and love that they are now traditions to take part in in our town. I like to pile up on the couch, drink hot chocolate and watch the Charlie Brown Christmas. Children's service on Christmas Eve night, then home for beer cheese soup, bread and Christmas drinks and lastly, opening gifts. Such a special night! I'd have to say that one of my family's favorite traditions is Mom's homemade eggnog. Nothing store bought for us! --at least not of the eggnog variety. So glad you found a new resource for your metal! My favourite family tradition is having Christmas on Christmas eve (I was born in Switzerland, and that's what we did there). We love to sit around the tree and share what we're greatful for. I love this time of year for that reason. Everyone is kinder and nicer. So glad everything worked out! Honestly I lvoe the small town festivals here in our town of 1000 - they are always well attended and full of good cheer! We pack up our kids and sneak away for 3 or 4 days every year. We go to the Great Wolf Lodge which just happens to be a winter wonderland. We live in snowy Michigan and we drive North to get there. Everything outside is thick snow and inside we are cozy and warm and we can sit in the hot tub and watch the snow falling all around the pools. It's really wonderful and we look forward to it all year. We try to see a local live Nativity each year. It always helps us bring things back into focus after things being so hectic to get ready for the holidays. Mr. Ken and I enjoy driving through neighborhoods and looking at the lights. Each year we choose a different neighborhood to go to. I LOVE my small town too, it's actually a BIG town but it has a small downtown which is cute and homey and has a parade at Christmas time too. LOVE it. I grew up here, my husband grew up here and we are raising our kiddos here! What could be crazier than dropping your kids off at the elementary school you used to be dropped off at. Anyways, fav. Christmas tradition ummm so many, but definately doing the "what God wants for Christmas" kids nativity scene the weeks leading up to Jesus' Birthday! What a time of praise! I should start the tradition with my kids too. Making a birthday cake for Jesus and celebrating the real reason for the season! Taking a moment to step outside late on Christmas Eve when the stillness has settled over everything and letting it wrap me up inside it. It is a small, perfect moment of peace. Peppermint shakes, "It's a Wonderful Life," and new pjs on Christmas Eve. I love to watch old Christmas movies.. classic! What a great giveaway! I have a couple of favorite traditions that are favorites. For some reason, we always get Chinese food on Christmas Eve. It started when I was in high school and seemed to just catch on. 30+ years later and with my own family and we're still doing it! My real favorite, though, would have to be waking up in the morning as a kid, listening to Mom getting coffee for she and Dad, and then Dad praying before we started opening any presents. They did an excellent job letting us know that presents were not the primary reason for Christmas. I posted a link to your site on my FB. I especially love your "Wife of a hero" necklace as my husband's in law enforcement. In a little dinky town, no less, so I know exactly what you mean about little towns. :o) My FB is at http://www.facebook.com/melodeebeth?ref=name. 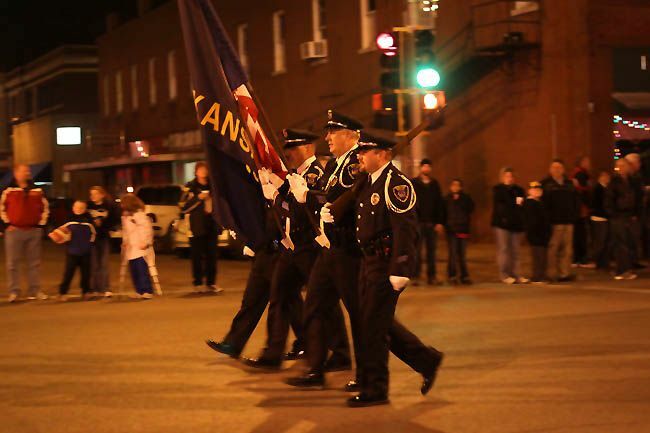 Love the parade pics! I grew up in a small towm. It will always be home. My children and I make a gingerbread house each year! Not sure when the giveaway ends, but I am hoping to get a "I Shoot People" necklace for my sister who is a professional photographer!!! Oops! I forgot to say my favorite Christmas tradition! Ever Christmas Eve, my dad makes the same meal - Swedish meatballs with mashed potatoes and gravy. YUMMY!! I love putting up the tree & our decorations, usually while playing Christmas tune! There is way too much about Christmas I love to narrow it down to a favorite - time spent with family, decorating, Christmas Bunco, time with friends, the music...I could go on and on and on and on! Going and looking at lights with my girls is my favorite tradition. My favorite tradition is eating breakfast and drinking coffee while I watch my kids open their presents. I luv that my MIL gives the kids new jammies on Christmas eve. The 12 days of Christmas for a family we barely know. One gift each night for 11 nights, secretly left on their doorstep. Each gift carries a Christian significance. On the 12th night we reveal ourselves by singing the 12 Days of Christmas on their porch. My favorite Christmas tradition is watching my 2 big girls act out the Christmas story! They started it about 3 years ago. Every Christmas Eve they collect all the costumes they will need to tell of the birth of our Savior! my hubby cooking french onion soup for dinner on christmas eve with no one around but our sweet family!! I make home made cinnamon rolls every chistmas morning. Thats what my dad did growing up and now I do it for my family. my mom makes crepes with raspberries every Christmas morning. I LOVE that! Favorite Christmas tradition: Midnight mass at the cathedral every year. Beautiful! Second favorite is the Christmas goose! Yes, we have goose and it is wonderful! My favorite Christmas tradition is making cut out sugar cookies with my kids and making numerous shades of buttercream frosting to decorate with. Posted the link to the giveaway on my Facebook page! On Christmas morning we eat a big breakfast at my parents house and then open presents. I love that time with my family! I used to live in the Czech Republic, where the traditional Christmas meal is carp and potato salad. I was none too enthusiastic about substituting turkey for carp, but I came to a happy compromise with my Czech wife. Czechs normally celebrate on Christmas Eve, so we ate carp on Christmas Eve and then had turkey on Christmas Day. Both traditions observed and everybody happy. i didn't get to see the parade in person...so at least i got to relive it through your blog. gotta love small town parades! one thing we do every year since i can remember, is watch "rudolph the red noised reindeer" and "miracle on 34th st" (the original) i love to curl up on the couch with sugar cookies and hot cocoa while i watch them. We live in HK... so obviously no small town living which I do miss. I was in the marching band in high school and college and always enjoyed parades. I love seeing the excitement and anticipation in my children, even in simply decorating the tree. Before we put the star on the top, my husband tells us the story of the star leading to where Jesus was born. We also read the Christmas story on Christmas morning and sing Happy Birthday to Jesus. My children are young so it's hard to compete with the joy of presents but we are trying very hard to raise them knowing why we celebrate, to be grateful and to give as well. 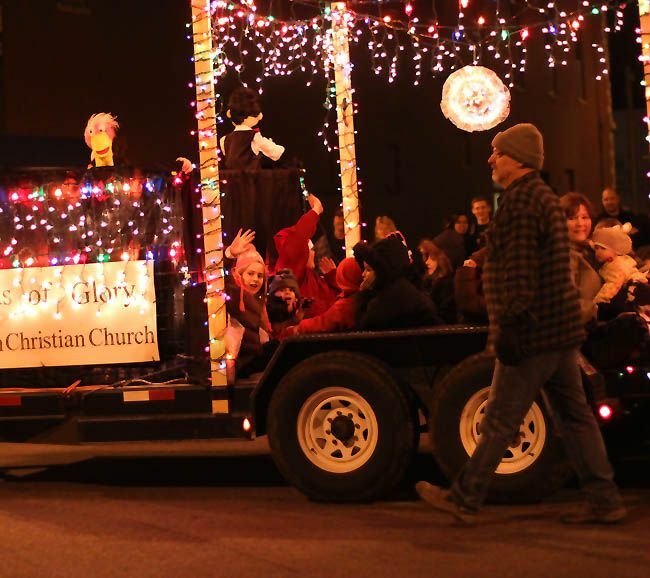 Rain or shine... we go to the lighted Christmas parade each year. This was my 13th year, my husband's 11th, son's 5th, and daughter's 2nd. love it! I posted about this on Facebook! Prim and Propah! I tweeted about this giveaway @primandpropah! Ooooops I forgot my Christmas tradition! We always play board games with the TV off on Christmas night. It's a nice way to spend time with the family and reconnect. It's loads of fun! Christmas craft and movie night! We always go to a Christmas Eve church service. Generally, my dh is singing or conducting or both since he's a church choir director. Last year was the best of all - our dd in college (who also sings in college) sang with him. Making Christmas cookies with my husband and two sons every weekend in December leading up to Christmas. That makes us so happy to spend time together, AND to eat the cookies!!! I love opening one present on Christmas Eve! Also new tradition at my in laws is early breakfast on Christmas Day. Cinnamon Rolls and Hot Chocolate!! I love giving the kids new jammies on Christmas eve. :) We did that as kids, and it's something I knew I wanted to do, too. I love the Christmas tradition of picking out a Christmas present to take to church on Christmas morning. When I was younger they were dolls etc but they've become more sensible. One year a boy brought his new puppy to church! 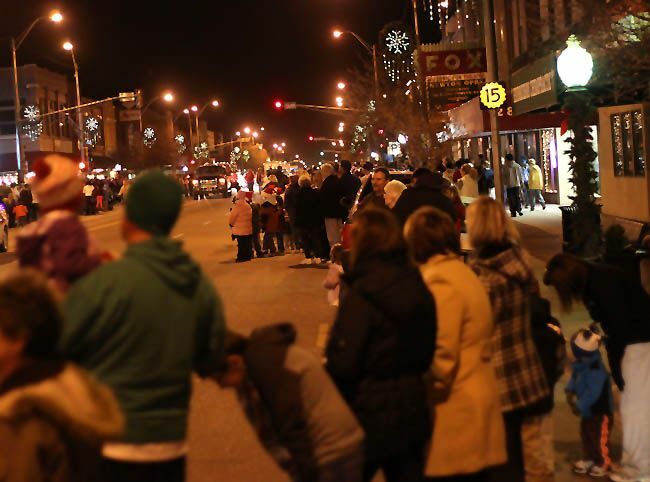 We live in a small town too and go to the Christmas Walk every year. Same thing, parade, hot chocolate, meeting people you know. our new favorite tradition is our elf on a shelf named "Twinkle." he sure is clever & gets into some amazing hiding places. but, the only problem is that i find myself waking up at 3am wondering if i moved that dumb elf. ha! j/k! I love that we always go to the candlelight service at church on Christmas Eve, and I also love my mom's coffee cake on Christmas morning! My favorite holiday tradition is taking the family to see The Nutcracker. We are so fortunate to have a world-class professional ballet company in our community. We get dressed up and head to the theater to enjoy the show. One of my favorite traditions is making all of the kids & my hubby new pJ's every year. We open them on Christmas and wear them throughout all of Christmas day! I LOVE seeing my family wearing goodies I made, and they love getting them from me (so they tell me)!!! Our tradition is going to look at Christmas lights on Christmas Eve and then coming home to open one gift...then it's off to bed so Santa can come! The next morning after presents are opened my hubby makes his wonderful French toast..yummy!! Then we stay in PJs all day and watch Christmas movies. I have a new favorite holiday tradition! This morning, the children at our church put on a Christmas play that melted my heart. This is our 3rd Christmas at this church, and every year is more beautiful than that last! Each year, we go to a very special Eve of Christmas Eve service in an old carriage house. It is a peaceful, reverent and simple service. We sing several songs with guitar accompaniment and a very short sermon. There are greenery and candles in the windows. It is a good way to put away the craziness of shopping and baking and settle down into what Christmas is really about. Waking up to snow. If we're in Minnesota, going to a crazy-early morning Julotta service at church (Swedish tradition to welcome baby Jesus on Christmas morning, you sing carols, drink coffee, all at 6 am - yes). If we're in Illinois, where we will be this year, going to Aunt Connie and Uncle Fred's house on Christmas morning (Aunt Connie and Uncle Fred's house is magical :) and seeing family that I love so much. Watching my cowboy cousin Buck (not his real name! lol) give the kids horse rides in the snow. Eating egg casserole and having Swedish sweetbreads and coffeecakes for breakfast, and then opening gifts - oh man. And all the fun and laughing and kids being crazy. It really doesn't get any better than that. I just can't wait. After nearly four years of being away from home (moved far away) we are back, and my heart is just bursting, looking forward to all of this. Making a birthday cake for Jesus and singing Happy birthday! Thank you for the chance to win! One of my favorite traditions is eating too much and watching my neice and nephew open gifts. Their excitement can't be beat! Too many favorites! Baking Christmas cookies, special decorations and music just for Christmastime, church and school programs, lots of family gatherings, reasons to shop...my birthday is also on Christmas Day but it will not be a favorite thing this year. It's a big one! My favorite Christmas tradition is putting up the Christmas tree the day after Thanksgiving. We have Christmas carols playing in the background.